I have Evernote on Big Dell and the phone of apps. I have Remember the Milk on Big Dell and the phone of apps. I have Reminders, Notes, and Scatterbrain on the phone of apps. Probably April of 2013, I threw some daffodil, narcissus, or jonquil bulbs in a naked patch of soil next to the foundation of the house, and left them to die down. Cruella de Garden. You know what was going through my mind. Yes. I would have nice little bulb whatevers popping up this spring. During late July of the same year, I decided to move the birdbath there, and I built a nice little four-layer brick support system to stabilize the birdbath. I am a garden engineer. Okay. Twice I’ve typed birthbath for birdbath. What does that mean? That’s rhetorical. Don’t answer that. At the end of the summer, I stored the birdbath but left the little brick chimney, thinking it would already be there for this year. I am the brightest crayon in the box. 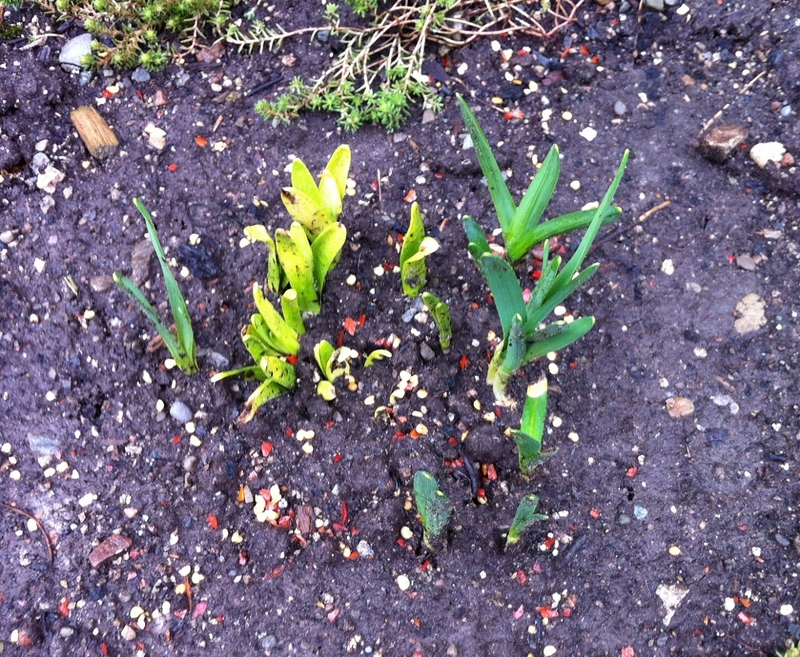 I completely forgot about the bulbs that I had plunked in the ground in April. This April, I was out trolling for signs of spring life. Anything. Anything not shivering under a deep crust of ice. Anything green at all. And I happened on two little green stems poking out in front of the tower. I was too busy krumping to run for the camera, so… You know. Total capture fail. But I did get this. You can see where two fat, red bricks were removed. Some stems were growing up the center and along the exterior, and then there is the great stem mash-up in the middle. Progress. 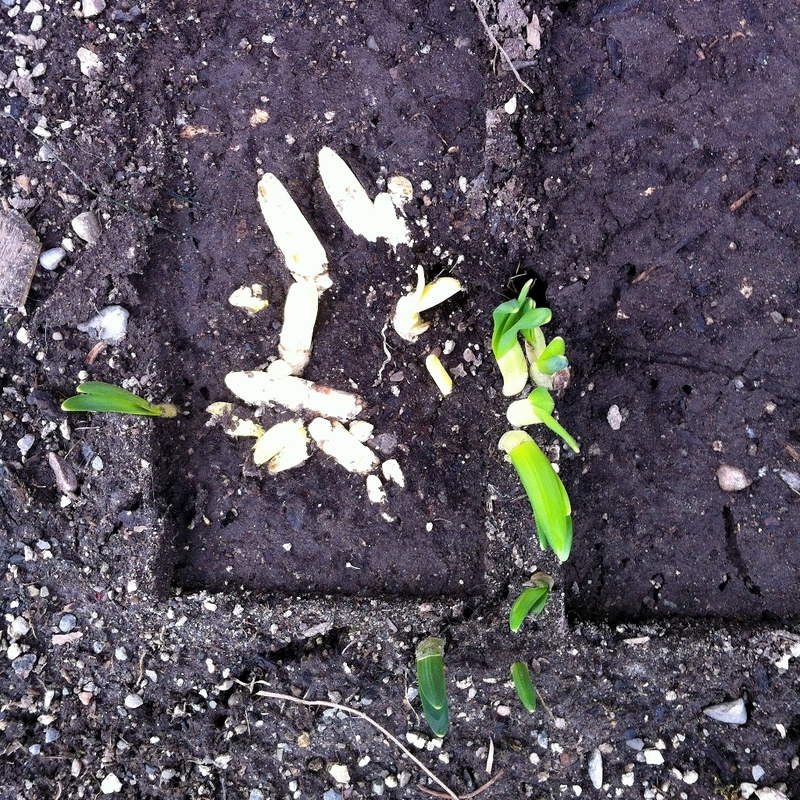 The white mash-up is wobbling to their stems but, sadly, those pesky squirrels had lopped off a couple of stems. Off with their heads! 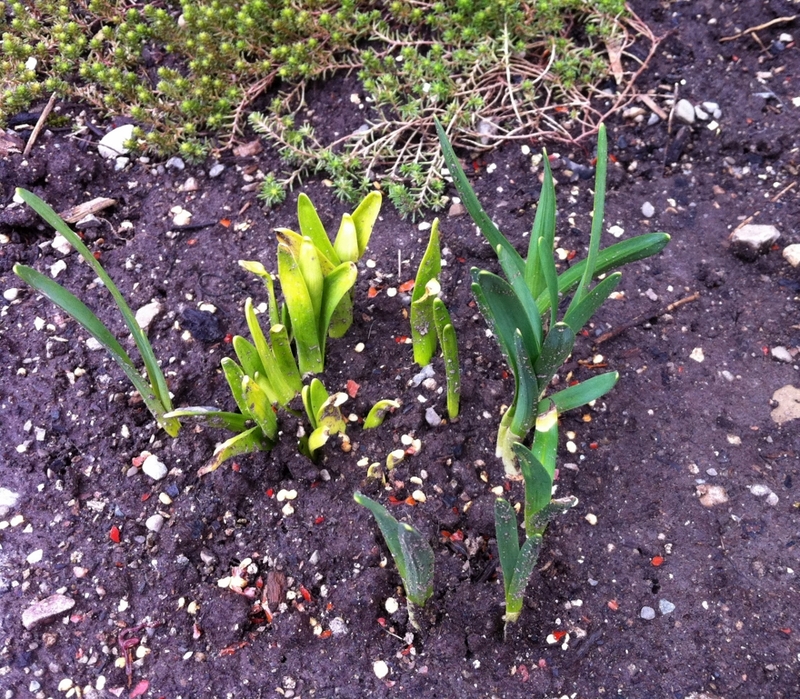 And I remembered why I kinda, sorta gave up on spring bulbs. 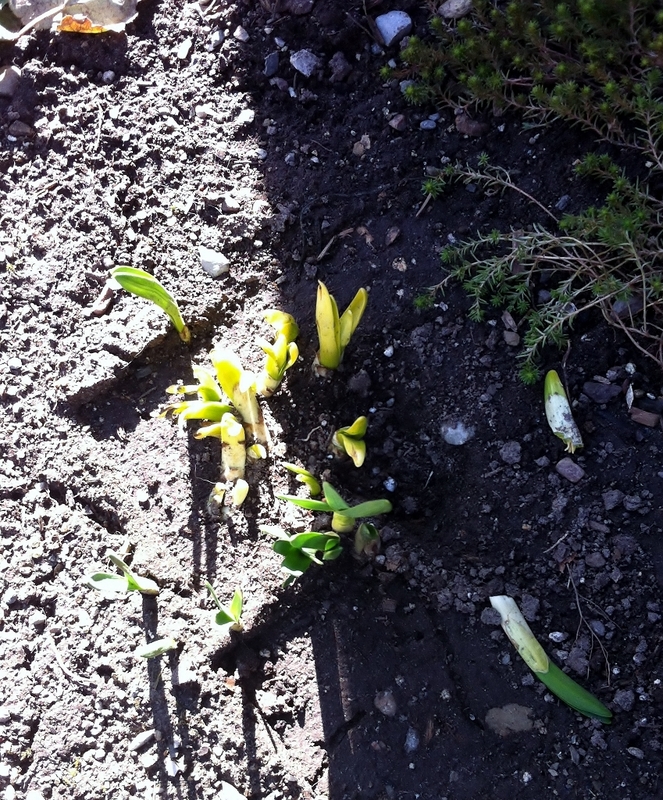 A couple of the bulbs had been wrenched out and left to wither on the ground. I tucked them back in and gave them a nice little pat and a bedtime story, and then I ran for my go to squirrel deterrent. Red pepper flakes — most often used back in the day for keeping the kitties from piddling by my front door. Now, there is a nice wee paver patio there. Extreme kitty piddle deterrent. This pic was taken yesterday. Things are looking up in spring bulbville. A Gloria Gaynor moment. For sure. Everybody in the room is rocking this song. [chuckle] birthbath…hoo boy… not goin’ there.